Many vintage amp connoisseurs have a special place in their hearts for the early Epiphone Electar amplifiers. 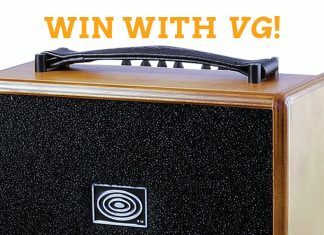 David Bromberg is one such fan; as he raved to VG recently about his 1938 Electar, “I’ve never had such a good amp. I’m just completely wild about it.” The art deco styling and the low-powered, warm-souled voice add up to a classic. Epiphone is wise to this. In launching its limited-edition 75th Anniversary Electar “1939” Century, Epi offers an amp that’s both a reissue and an update in smart ways. Call it the best of both the vintage and modern worlds. The amp’s looks will catch your eye first. 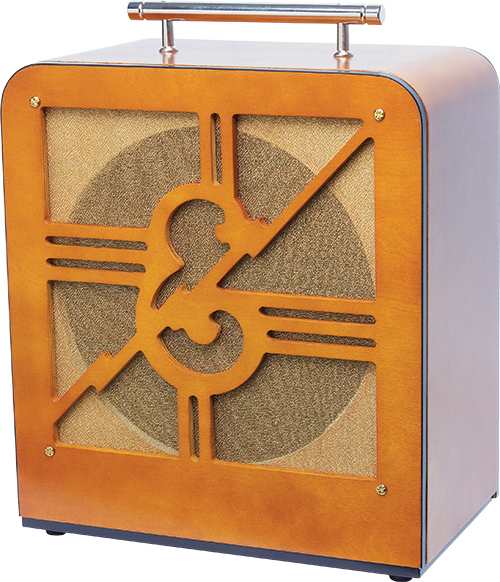 The Electar faithfully reproduces the classic 1930s styling with its sleek wood cabinet highlighted by the “E” cutout over the vintage-styled grille cloth. The all-metal handle crowns it. But beauty’s more than skin deep. Inside, the Electar features newly designed, all-tube electronics. The small amp’s 18 watts of power sound louder than you might expect, singing out through the single 12″ speaker. The design is Class A/B, featuring pairs of both 6V6 and 12AX7 tubes. Controls include a master Tone knob and an oh-so-modern master Volume with a push/pull Boost. Interestingly, the Electar includes three uniquely voiced inputs: Bright, Normal, and Dark. Each live up to their name, but with judicious use of the Tone control, you can edge into the other voices’ territories nicely. There’s also an internal bias adjustment for further tone control. What better guitar to assess the amp’s old-meets-new character than a ’52 Gibson ES-5? Not surprisingly, the ES-5 and Electar fit each other well – both stylistically and sonically. The amp instantly offered warm, jazzy tones with depth and rich sustain. This is what it was designed for back in the 1930s, after all. And yet for such a small, lower-powered amp, the “1939” boasts plenty of head room. Dialing up the natural volume, the Electar readily moves into an overdriven grind that sounds ideal for lowdown vintage blues. Working the master Volume, either with or without the Boost control, provides even more drive. The Electar “1939” Century is equally happy playing old or new music – which should come as no surprise considering its intelligent mix of old styling and modern electronics. Whether you’re blowing out a bebop jazz line, blasting the blues, or even picking some primal rock and roll, this little beauty is a heartthrob.